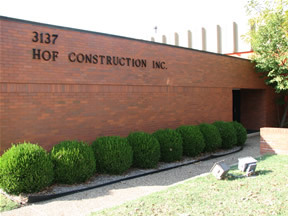 Hof Construction, a sole proprietorship, was founded in 1911 by Fred Hof, owner and operator. From 1911 to 1951, the administrative headquarters were located at 6602 Hoffman Avenue in the St. Louis Hills neighborhood. The office then moved three addresses to the west to 6614 Hoffman. In 1976, as the third generation began to assume management positions, the business entity changed to a corporation and subsequently moved one block west to the current headquarters at 3137 Jamieson Ave.